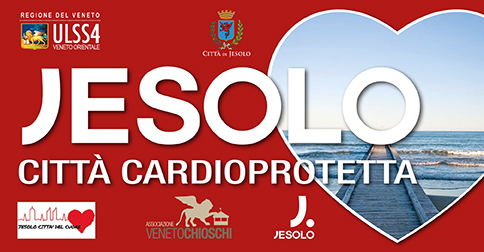 Jesolo is a Cardioprotected City: 98 AEDs - Semi -Automatic External Defibrillatorsare positioned on the territory, thanks to the project created by the collaboration between the Municipal Administration of Jesolo andthe Azienda Ulss 4(Local Health Authority). In case of sudden cardiac arrest, the use on an AED can make the difference in rescue timeliness and help save lives. Some devices are positioned all year round, others only during the summer season. Download the map to know the positions of the devices. Historical city centre Map (165.24 KB). Lido of Jesolo Map (363.63 KB).